As you know from previous posts (2010, 2011), I love this month. I like seeing poems pop up on my RSS and Twitter and assorted other feeds; I like having excuses to talk about poetry (even more than I usually do), and I like giving myself time to read poetry in a more concentrated way. This year, I also liked developing a raft of new family-friendly art&poetry events for the museum. The Massachusetts Poetry Festival is happening in Salem again this year, at the end of this week (Friday-Sunday). PEM is a host for a number of reading and concert events from the larger festival (I’m particularly looking forward to the Typewriter Orchestra), but I’m also spearheading a collection of activities tying the visual to the verbal arts for kids and families, including a collaborative paper mural “Grow a Poet-tree,” make your own magnetic poetry, illuminated capitals word-art, a docent-led poetry tour, and a self-guided Poet Quest. 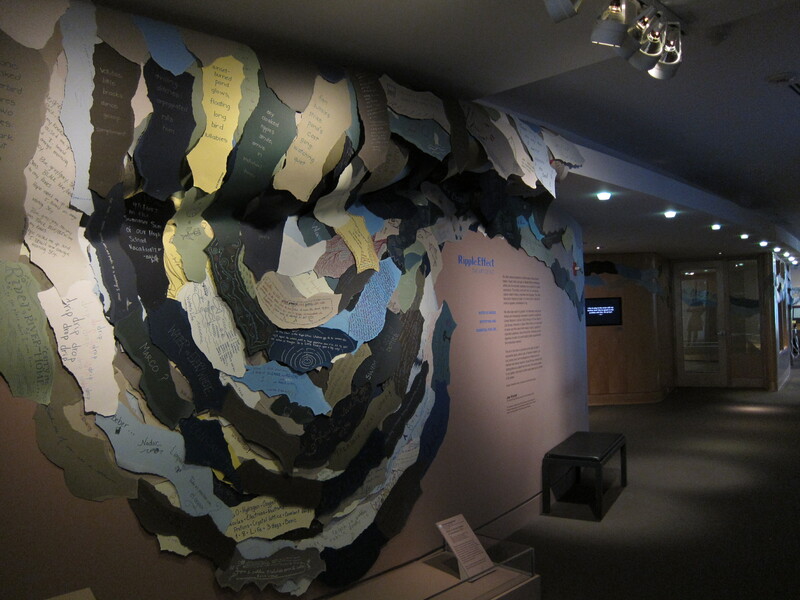 "River of Words: Stream of Conscience" as installed in Ripple Effect, the Art of H2O at the Peabody Essex Museum. Photo by me. 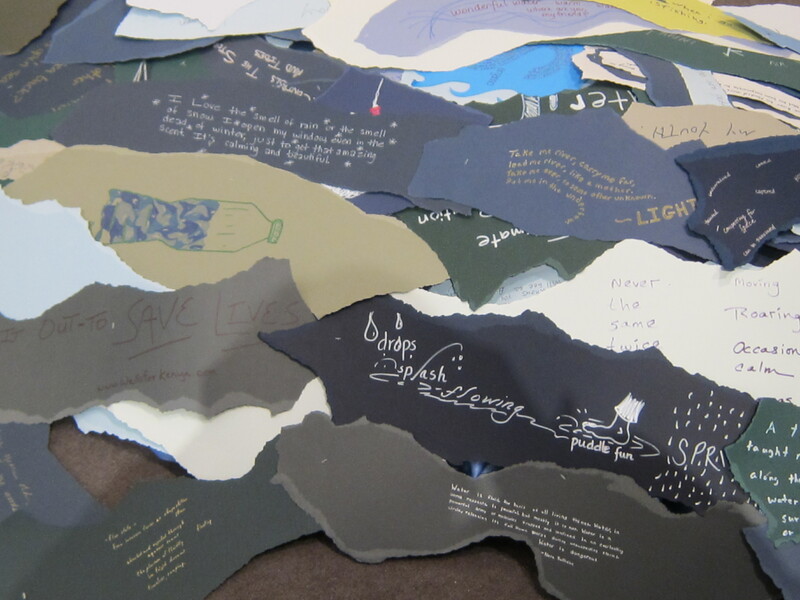 Detail from the "River of Words: Stream of Conscience" project by Christine Destrempes. Photo by me. For more info, check out the MA Poetry Fest’s spotlight on PEM’s involvement with the MA Poetry Festival this year, and another article featuring my family-focused events. 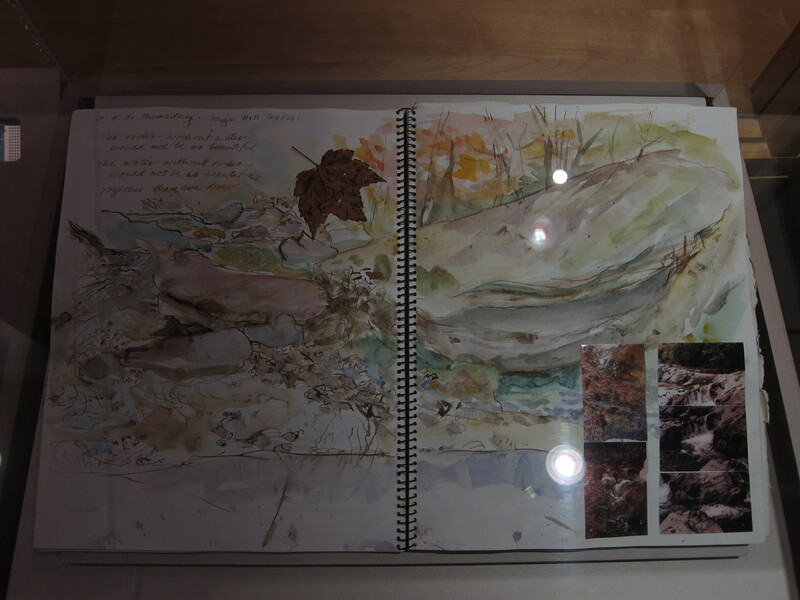 Sketchbook belonging to Ripple Effect featured artist Janet Fredericks, who writes poetry in connection to her "Tracings" river drawings, also featured in the exhibition. Photo by me. 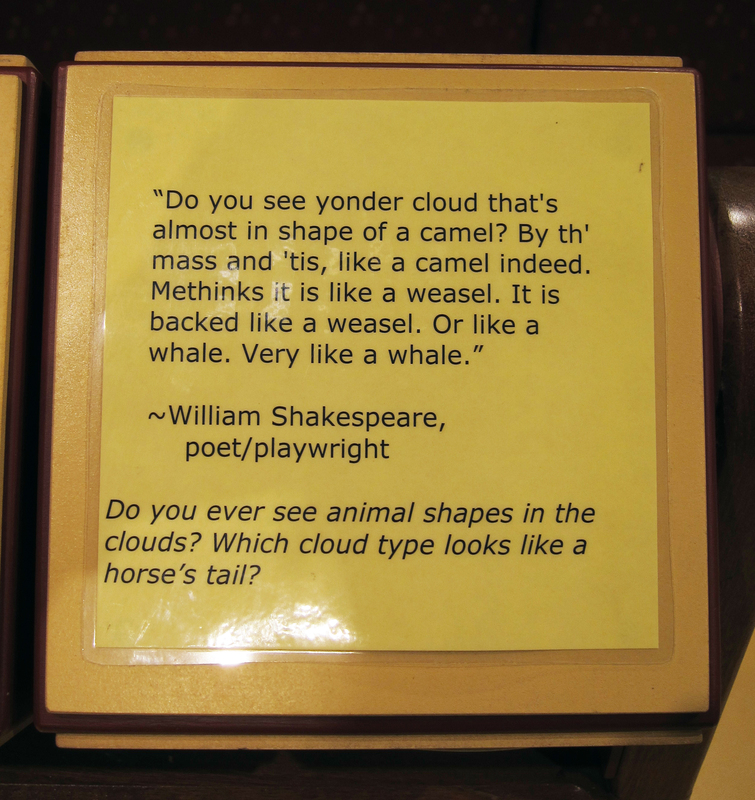 Methinks that cirrus cloud is ruffled like your shirt collar, Master Shakespeare. Photo by me. 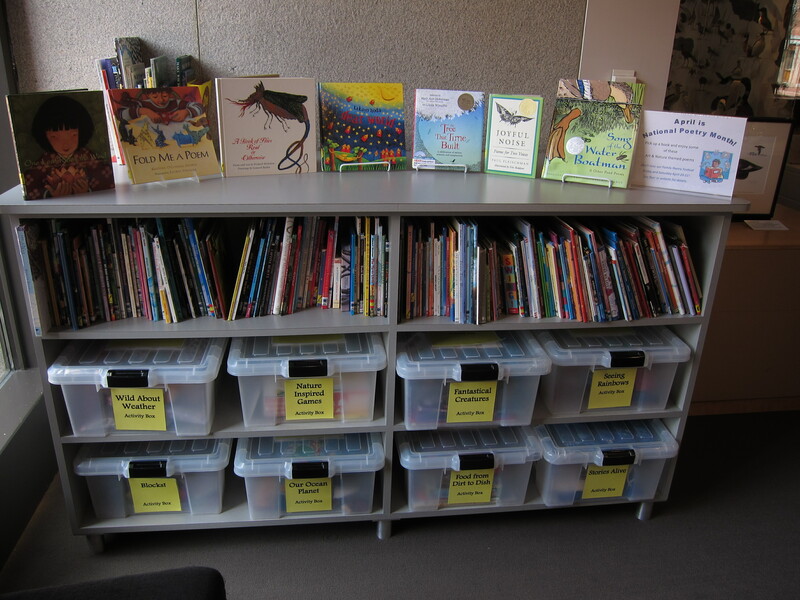 We’re also highlighting poetry in the Art & Nature Center’s popular “Books and Boxes Zone”–come by to check out some of our fantastic books! Plenty of fun things to read, by many of the ANC's favorite writers! Pull up a couch, grab a puppet or a friend, and enjoy. Photo by me. 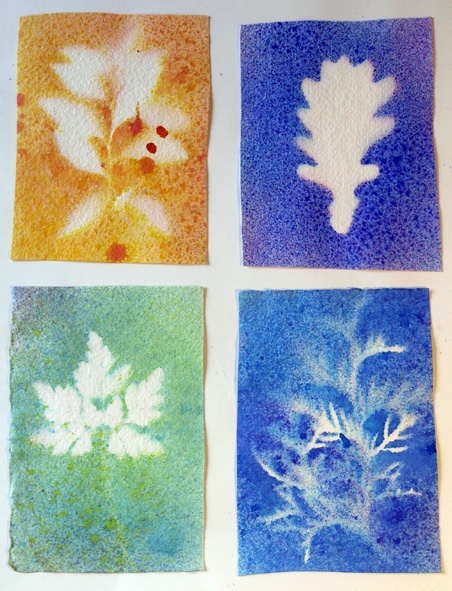 It’s warming up, it’s almost school vacation week here in Massachusetts, and as the leaves are starting to unfurl I thought I’d offer up some paper-craft options for fresh-air fun. In 1930s London, parents made up for a lack of garden space by suspending infants high outside tenements in wire cages. That’s an idea whose time has fortunately gone by, but if you’ve got that spring-air fever, may I recommend a fair-weather fort made of newspaper? Indulge your architectural side and build a geodesic dome out of rolled newspaper struts. (Alternate directions also available here.) 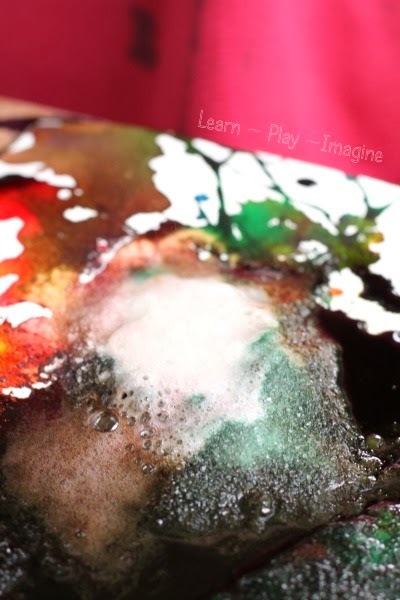 This is a great activity in small scale or large — I’ve done it with visitors both ways, and it’s always a big hit. Just typing this makes me want to build one in my backyard. There’s some fun inspirational architecture-via-recyclables here: Amazing Recycled Architecture. And while you’re into the newspaper-folding mode, and out in the backyard, try out a six-sided kite or these neat biodegradable newspaper seed-starter pots. Or make yourself a useful newspaper basket, perfect for a picnic in your geodesic fort. Hammocks are good. Human sized bird nests may take the cake, though. Click for further pictures! Looking for other great recycled-material activities and a way to get out of the house next week? 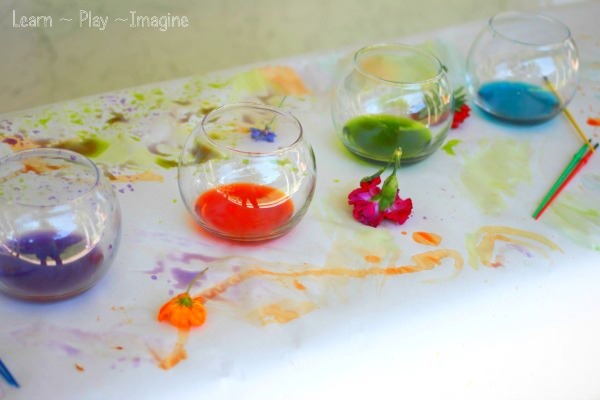 Check out this list of upcoming events for Trash Springs to Life at the Peabody Essex Museum! You would think I’d be done with cool snow-themed links by now, right? Nope. Find all kinds of cool facts about the solstice today from National Geographic (you’ve all noticed I love these guys by now, I should hope?) I particularly enjoyed the mention of Newgrange, an incredibly cool Stone Age monument/tomb in Ireland which is 1000 years older than Stonehenge. When it was built, it was designed to exactly align with the winter solstice dawn. I visited it in summer, and it was still impressive then. What’s the solstice without a touch of celebration? Despite my general fondness towards things historical, I haven’t tried either of these recipes yet. However, they look delicious and have very positive reviews, so taste at your own discretion. Happy Holidays to all! This blog will be going on vacation until Jan. 2nd, 2010. May you and yours be safe, warm, merry, and curious this holiday season. I was going to post this tomorrow, but in honor of the enormous blanket of white stuff covering the East Coast from DC northwards, I’m posting early. On a day when temperatures are below freezing (the colder the better! ), get a mug or pot of boiling water and bring it outside. 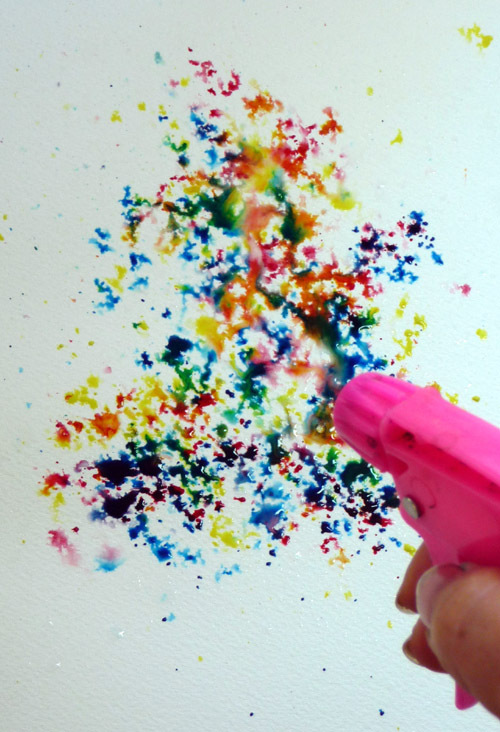 Toss the water in the air (away from yourself and any innocent bystanders!) and watch the water flash freeze into a cloud of ice crystals. NB: If you do this at your school or museum, do not direct the water where ice will fall on walkways, parking lots, or visitors. All things being equal, cold water freezes faster. It takes time for the energy contained in a hot object to be transferred to a cold object. However, the rate of heat transfer is proportional to the temperature difference between the two objects, so hot water will lose heat faster than cold water. In other words, if you have water at 90 degrees C and water at 10 degrees C and the freezer is at -10 degrees C, the hot water will lose heat five times faster than the cold water; however, the cold water will still win the race. As the hot water cools it’s rate of heat transfer will decrease, so it will never catch up to the cold water. Some people claim that hot water freezes faster because a pot of boiling water can be thrown into the air on a cold winter day, and it freezes in mid air creating a shower of ice crystals. 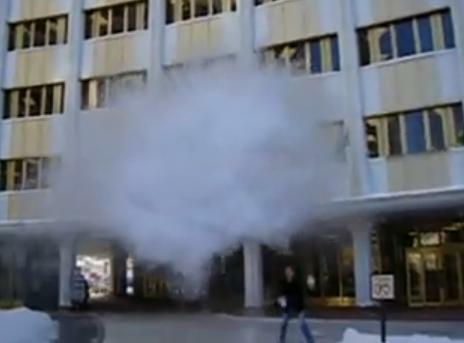 Whereas a pot of cold water thrown into the air comes down as large blobs of water. This happens because the hot water is so close to being steam, that the act of throwing it into the air causes it to break up into tiny droplets. (hot water is less viscous than cold water, listen to the sound it makes when you pour it in the sink) The small water droplets have a large surface area which allows for a great deal of evaporation, this removes heat quickly. And finally, the cooled droplets are so small, that they can be easily frozen by the winter air. All of this happens before the water hits the ground. Cold water is thicker and stickier, it doesn’t break up into such small pieces when thrown into the air, so it comes down in large blobs. 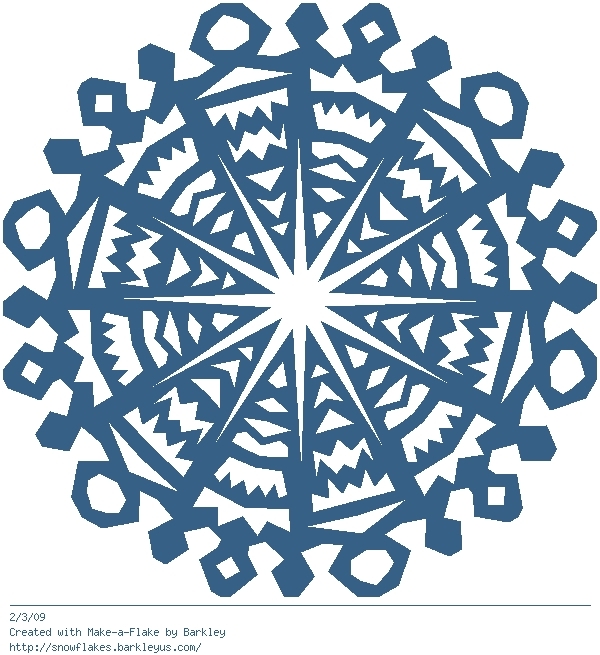 Plus an extra-cool kaleidescope snowflake generator, with thanks to Paul Orselli of Exhibitricks for the link! I love the option to spin your crystals round not only in two, but in three dimensions. 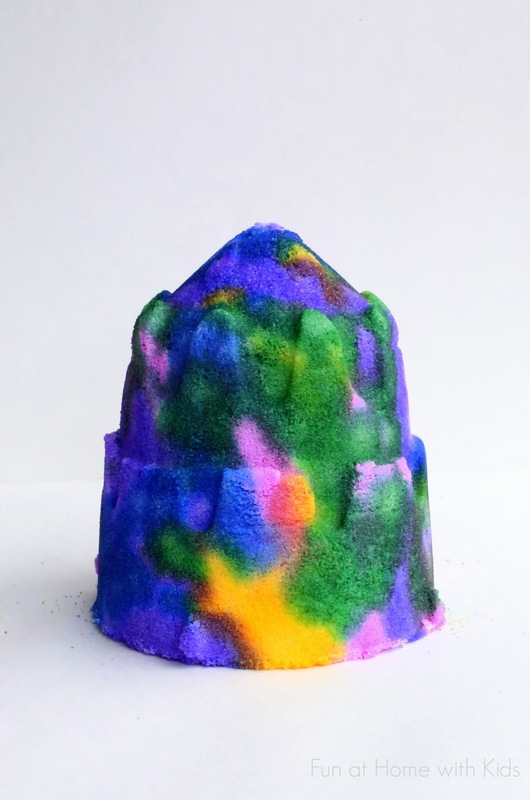 Here are a bunch of snow activities to try, to celebrate last week’s first intense snow of the year. 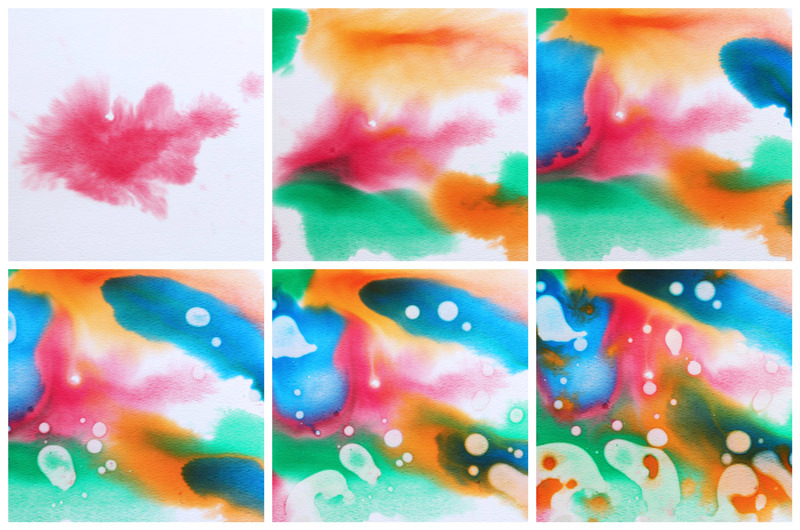 Fold a piece of paper or a coffee filter in half. Then fold it in thirds from the middle point. (As if you were making ‘pizza slice’ shapes, so that you have 6 triangles.) Trim the edges so that you have roughly a circle, if you are using a regular piece of paper. Cut along the edges and folds, then unfold for a proper 6 pointed snowflake! 1. Jump snow hurdles: Lightly pack a bunch of basketball-size snowballs. Use them to build a course of hurdles to jump over in a round of follow the leader. 2. Get on a roll: Pair up for a contest in which the object is to finish with the biggest snowball. The contest ends when the teams can no longer roll their entries or when you run out of snow. 3. 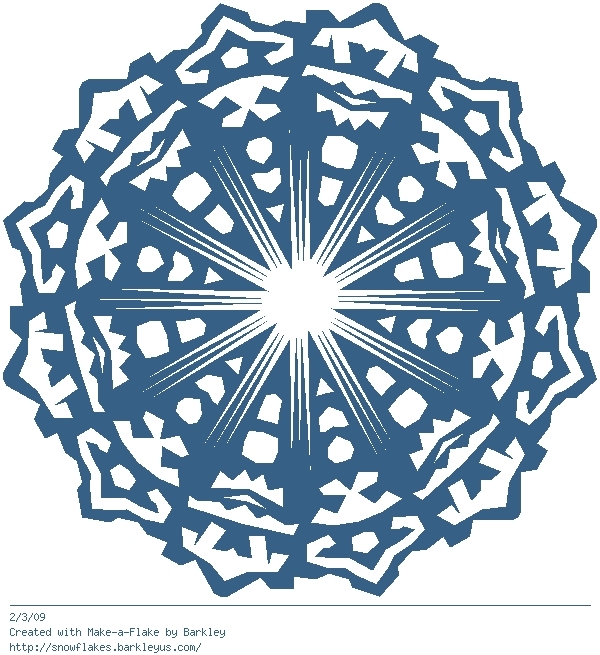 Catch a snowflake: Find out what’s different ? and the same ? about a bunch of snowflakes. Catch some on a piece of black construction paper or a dark mitten or sweater. 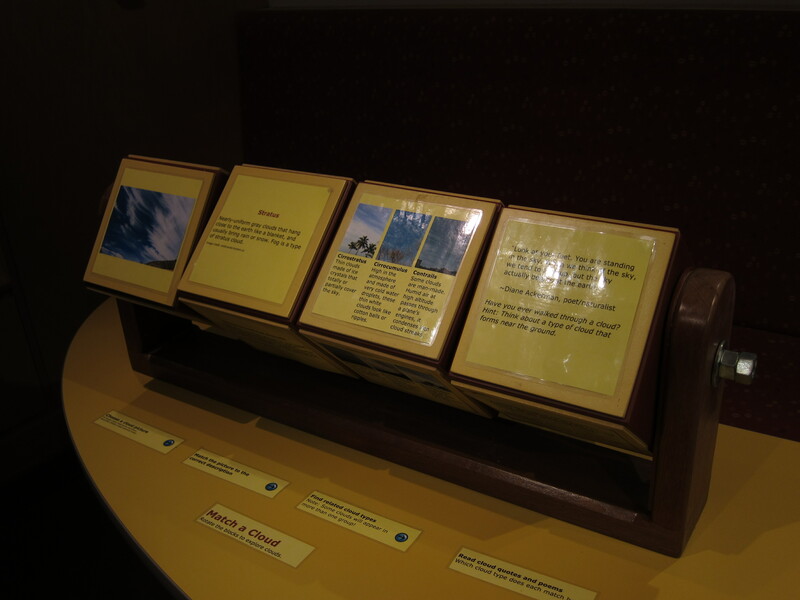 At The Discovery Museums, we have a bunch of blue-velvet covered cardboard squares available for snow-catching. We tend to store them in the freezer so they’re snow-ready! Stay tuned next week for icy cool science!